Regional physical media chain Bull Moose recently opened its doors in the old Video Headquarters location in the Hannaford plaza on West Street in Keene. They carry a wide variety of media including video games, cds, vinyl, DVD, Bluray, and even books! It’s refreshing to see someone trying to keep physical media distribution alive – hopefully it works out for them. 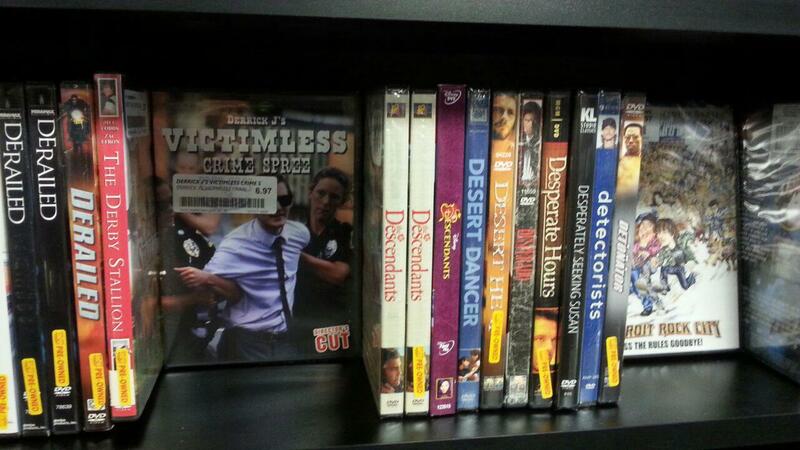 Kudos also to Bull Moose for carrying Keene-produced-and-edited documentary Derrick J’s Victimless Crime Spree on DVD! DJVCS DVDs on-the-shelf at Bull Moose, Keene! Of course, you can watch the feature-length documentary produced by Free State Project participants for free in its entirety online, but that doesn’t do you any good if you’re looking for a gift for this holiday season. Victimless Crime Spree makes a great stocking stuffer, and Bull Moose in Keene is selling it for LESS than Amazon! Amazon has it listedfor $7.93 while Bull Moose has it on-the-shelf, brand new, for just $6.97! There’s no cheaper place to purchase the Director’s Cut DVD, which is loaded with hours of bonus footage and even features TWO commentary tracks! Bull Moose has three copies in stock as of yesterday, so if you’re looking for a perfect last-minute gift, stop in to 401B West St. in the Hannaford plaza. They’re open until midnight tonight and 7pm on Christmas Eve. If you don’t live in the Keene area, just grab your copy at Amazon where it qualifies for Amazon Prime and Free Super-Saver Shipping! Global pre-paid wireless minutes. Face value. Fiat free. Youtube is censoring Rebel Inc.
I’m looking for someone to transcribe Derrick J’s Victimless Crime Spree. This was a suggestion from Michael W. Dean last night on his podcast Freedom Feens. His reasoning was that if there are subtitles to the movie, then it can be translated into other languages. That would allow a much further reach for the movie and ultimately, the ideas of peaceful resistance and voluntaryism in action. I’d be happy to send a specially signed copy of Derrick J’s Victimless Crime Spree (Directors Cut) to any volunteer who transcribes the movie. Be the first to get in touch with me at derrickjfreeman (at) gmail.com. This weekend, I have had the pleasure of sitting down and chatting with some wonderful people. First, Ernie Hancock of FreedomsPhoenix.com had me on his radio program to talk about the release of my movie, Derrick J’s Victimless Crime Spree on DVD. You can listen to that interview (without commercials) below! Finally, I was delighted to be invited to participate in the Live Sunday Call-in show for the Freedom Feens with Neema Vedadi and Michael W. Dean. Those guys always crack me up. We had a hilarious discussion where I covered (of course) Victimless Crime Spree as well as Peace News Now. This show is unusual, however, in that it is the first and only time that I have publicly explained my situation with Adam Kokesh. What do YOU think? Enjoy! I look forward to bringing Stefan the very best of your questions. Feel free to tweet them at me (@derrickjfreeman) if you don’t have time to listen in. I love Sam’s style. She calls it “collage.” She works with a lot of blurring the lines of different artforms, in a way that blows my mind. She did the first-ever banner for this very website, and was also my competition during a recent costume competition at a New York City burlesque show. I was horrified and delighted at the same time, and I hadn’t even taken my drugs yet. There’s something so deeply captivating to me about her animated collages, if not for just the simple fact that they’re so much fun to look at. Sam is an amazing artist in my opinion. She just joined up with the amazing crew over at TrueFalseTheatre.org. If you want to check out more, you can subscribe to her blog as well as her vimeo account.